Maggie the Elephant is getting ready to leave the Alaska Zoo and head down to California to live at an elephant sanctuary. This has caused lot a of ruckus in Alaska regarding a) the ethicality of keeping a desert (read: hot weather) animal in an arctic environment and b) spending such a huge sum of money to transport an animal down to California. 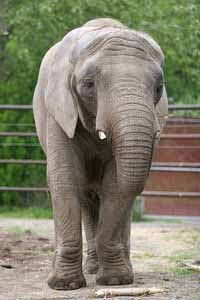 The move went forward only after Bob Barker donate $750,000 to care for the elephant in her new home. ok, "ethicality' probably isn't a word, but it sounds good and I'm pretty sure everyone got its meaning.